The Landmark given green light for city living. 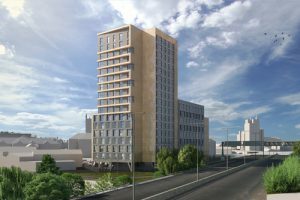 The Landmark, a gateway 17 storey building, has been given backing by Derby City Council, providing a significant boost to city living in Derby. The building will bring 202 high-quality Build to Rent apartments to a currently vacant site in Phoenix street bringing a boost to city centre businesses with new residents using services and facilities.